More often than not, married couples do not retire simultaneously. And with more people going through grey divorce and remarriage, or staying employed well into their senior years, that staggered staging of retirement will only become more prevalent. “We tend to think that people retire at the same time, but when we take a longer approach and look at multiple years, we see much more diversity,” Katherine Carman, a senior economist at Rand Corporation, told WealthManagement.com. Carman was lead author of a study based on data from the University of Michigan Health and Retirement survey, which studied 2,600 couples and found 1,400 unique retirement pathways among them. The study found that younger households were more likely to undergo discordant retirement — when one spouse works longer than the other. It was also more common in couples with larger age differences. While retirement plans are typically created with individual retirement dates in mind, financial advisors might do well to consider discussing discordant retirement with clients. 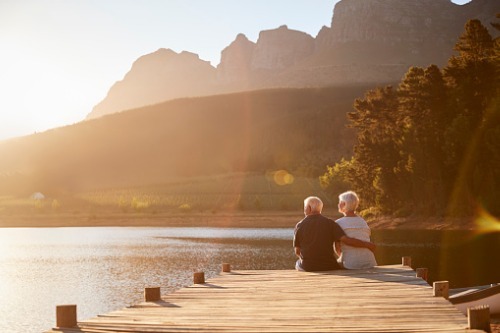 “What is most important is to discuss the expectations and visions for retirement—both as partners who plan to retire at different times and also if and when they plan to be retired together,” Kathleen Burns Kingsbury, an expert on wealth and psychology, said to WealthManagement.com. Aside from financial considerations — for instance, how should a couple prepare for their decreased cumulative income when one partner retires ahead? — couples should explore each person’s desires in retirement and how those different visions can work together. Helping people communicate openly about this could be an opportunity for advisors to provide value and be more holistic in their guidance. In a recent survey, Fidelity Investments found that 43% of married couples didn’t agree on what age they will retire at, and 54% didn’t know how much they’ll need saved for retirement (including 46% of people who are in or near retirement). “Ask them curious open-ended questions to find out how each partner views retirement and then facilitate a conversation about how these visions complement each other and may also cause conflict,” Kingsbury suggested. Beyond one-on-one meetings, she said planners could consider offering workshops and online courses for a fee to existing and potential clients. Discordant retirement doesn’t only present challenges. For instance, the continued income from one spouse could help soften post-retirement financial blows like emergency health problems or major home repairs; the income could also allow the retired spouse to pursue a passion. Having one spouse stay in the workforce could, in some cases, enable both to stay on employer-subsidized health insurance. And provided that the couple’s cumulative income and savings pools are large enough, the retired spouse may be able to delay claiming their pension, resulting in larger benefits down the road.